Finding Best Bond mutual fund is important for investor. 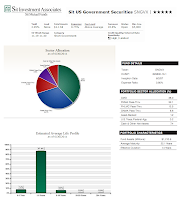 Sit US Government Securities fund is part of best short term government taxable bond fund. This fund will be reviewed in details. The Sit US Government Securities fund objective is to provide current income and safety of principal. This Sit fund invests exclusively in U.S. government bonds, which are securities issued, guaranteed or insured by the U.S. government, its agencies or instrumentalities. It also invests a substantial portion of assets in pass-through securities. The fund adviser attempts to maintain an average effective duration for the portfolio of approximately 2 to 5 years. This top government bond fund manager is Michael C. Brilley. Brilley has managed this fund since its inception in June 1987, 23 years ago. Investor will be charged an annual expense ratio of 0.75%. This figure is a bit lower compared to the average in the Short Government category (0.88%). As explained on the details, there is no 12b1 fee, no front end sales load, and no deferred sales load for this fund. This SNGVX fund has total net assets of $ 1.15 billion. 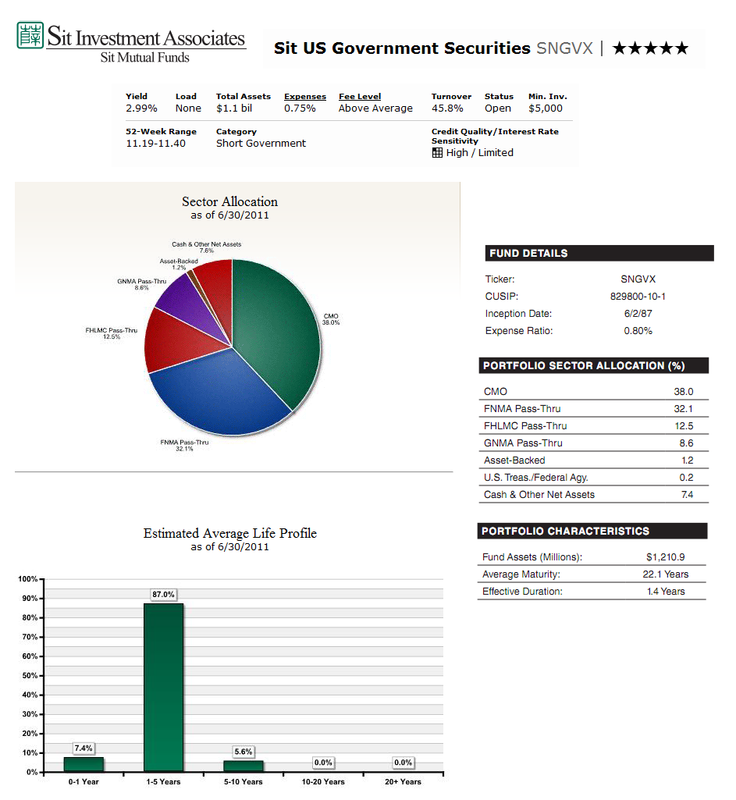 This best bond fund portfolio turnover rate is 45.80% as of August 4, 2011. This is the only class available for this bond mutual fund. The benchmark of this fund is Barclays Capital Intermediate Government Index. Investing in this fund can be done by opening account in your brokerage or IRA account (retirement account). The initial investment is $5,000 for regular brokerage and $2,000 for IRA account. Subsequent minimum investment will be $100. This SNGVX fund can be purchased through 74 brokerages like E Trade Financials, T Rowe Price, JP Morgan, Common Wealth NTF, Pershing Fund Center, Fidelity Retail Funds Network, Schwab Retail, Firstrade, Investacorp NTF, Ameriprise Brokerage, etc. Please check your brokerage for details. The top 5 portfolio sector allocation of this fund as of June 2011 is CMO (38.0%), FNMA Pass-Thru (32.1%), FHLMC Pass-Thru (12.5%), GNMA Pass-Thru (8.6%), Cash & Net Other Assets (7.4%), Asset-Backed (1.2%) and U.S. Treasury/ Federal Agency (0.2%).